On April, 15th, 1895 the first Niagara Generator, which bore Tesla’s name and patent numbers, was tested . It ran at full speed, 250 revolutions per minute, and proved quite satisfactory. This Niagara Falls, N.Y. power plant went into operation on August 25, 1895. The Adams Power buildings would see extended building expansion and equipment added continuously for the next 7 years. The current and still remaining Adams Transformer House building was designed by the architectural firm of McKim, Mead and White, who also designed other important architecture such as the Brooklyn Museum in New York City and the National Museum of American History in Washington, D.C. This massive project used locally quarried limestone from nearby Queenston, Ontario, Canada. The Cataract Construction Company and architectural firm made the decision to employed mostly tradesman and stonemasons from Italy who could provide the expert craftsmanship for the beautiful architectural designs of Mr. Stanford White. The power generator and transformer houses were built near the upper Niagara River. Powerhouse One was designed for twenty-one generating units. A channel brought water from the river to the generators, which then passed into a 7000-ft tunnel, the earth’s gravity moving the water downward beneath the city, eventually making its way to the lower Niagara River below the falls and ending near the present-day site of the Rainbow Bridge. This 16 million brick tunnel measured 18-ft by 21-ft and required over 3 years to build. 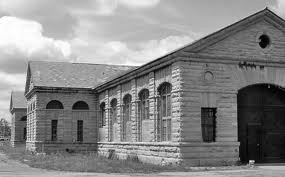 The Adams Power Plant at start had three generators producing 5,000 horsepower each, or 2,200 volts. The plant operated by Nikola Tesla’s ideas and designs for large generators that produced enough AC (alternating current) to enable the electric current to travel twenty-two miles from the Niagara Falls area to the city of Buffalo, New York. 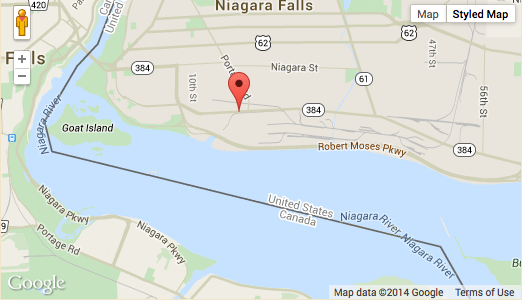 Much of the power was relayed through a building in the village of North Tonawanda, N.Y. called Power House No. 4, that acted as a terminal for the Buffalo and Niagara Electric Train Company. In the following year, on November 16, 1896, the power plant’s energy was powering electric lights 400 miles away in New York City. By 1905, it was producing and providing one-tenth of the United States’ electrical power. The “Niagara Falls Power Company” triggered the development and the industrialization of city of Niagara Falls. The original Westinghouse generators remained in operation until 1961. The Adam’s Transformer House is the only surviving building of the original Edward Dean Adams Power Plant. In 1998 a local business person, Mr. Peter Fontanarosa, purchased the building. He and his family have diligently taken on the task of care taker for the past 17 years. We are forever thankful for his insight and hard work in maintaining this national and historic building for the future. Download is 62 megabytes, it could take 20-30 seconds of time !